I regret that for most of my adult life, I treated sleep as more a luxury than a necessity. There was always something more to do before I crawled under the covers and turned out the light. I realize belatedly that I might have been more productive — and a lot nicer to live with — if I had given sleep its proper due. By failing to acknowledge chronic sleep deprivation, I dozed during countless cultural events, and on two occasions I fell asleep while driving, barely escaping disaster. I have since reordered my priorities and learned to avoid distractions and activities that can keep me from getting the sleep my body and mind really need. About 70 million Americans sleep poorly or not nearly long enough to achieve the full physical, emotional and cognitive benefits sleep can bestow. There are myriad reasons, ranging from self-inflicted disruptions to those that are seemingly unavoidable. But there are also potential solutions to most of the factors that can interfere with sleep. For the sake of your health and longevity, I urge you to give them a try. How much sleep do you need? Sleep requirements depend on age. Newborns sleep 16 to 18 hours a day, preschoolers need 11 to 12 hours, and elementary school children need 10 hours. Adolescents should get 9 to 10 hours, though most teenagers sleep only about seven hours. Given the opportunity to sleep as long as they want, most adults average about eight hours a night. There are individual differences, of course, but the usual range is between seven and nine hours. Getting less than the amount of sleep you need during the school or workweek builds up a sleep debt that cannot be fully erased by “sleeping in” on the weekend. This pattern can also mess up your biological clock, making it hard to get up on Monday morning. It was long ago shown that a midafternoon nap of about 20 minutes can improve alertness and productivity and reduce mistakes among sleep-deprived workers, yet few employers offer a midday lie-down or provide a place for one. Age also affects the quality of sleep and the amount of time spent in the various stages of sleep. These include REM, or rapid-eye-movement sleep (often called dream sleep), and three types of non-REM sleep: the light sleep of Stage 1, followed by the more relaxed sleep of Stage 2 and the most restorative deep sleep of Stage 3. Young children spend most of the night in deep sleep, which is why they can often sleep through loud noise, bright light and being carried from car to bed. But with age, the time spent in deep sleep diminishes and any number of disturbances can cause awakenings. For women going through menopause, for example, sleep is often interrupted by hot flashes. Even if there are no external disturbances, elderly people may be awakened many times during the night by the discomforts of illness or pain, the side effects of medication or the need to urinate. Poor sleep among the elderly may in part account for problems with memory and concentration, depressed mood and daytime sleepiness. I often see gray heads nodding off at events, even during matinees. If noise or light disturbs your sleep, you can counter them with a white-noise machine and light-blocking shades. Keep the room cool and avoid weighty covers. 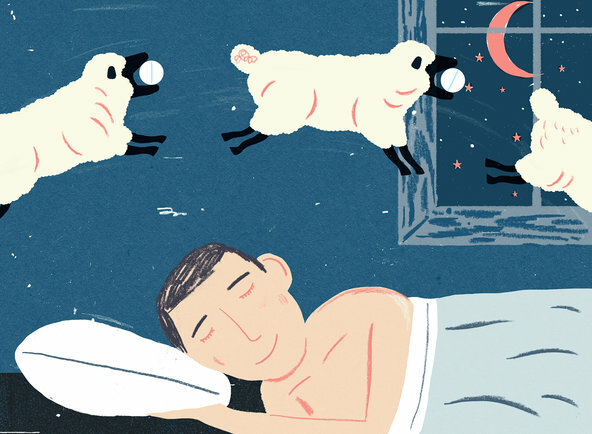 Two years ago, I summarized factors that commonly interfere with a good night’s sleep, but a quick review, followed by some valuable new tips that have helped me, may help you too. EXERCISE Physical activity leaves you tired, but if you do your workout within two or three hours of bedtime, you may be too revved up to fall asleep easily. MEDICATION Many drugs, both prescription and over-the-counter, contain stimulating chemicals like pseudoephedrine and caffeine, commonly found in decongestants and painkillers. Beta-blockers, used to treat certain heart conditions and high blood pressure, may be disruptive as well. Ask your doctor if you can use an alternative drug. FOOD AND DRINK Eating a big meal close to bedtime can be a problem, especially if you are prone to indigestion. Drinking a caffeinated beverage late in the day can disturb the sleep of anyone who has not developed a tolerance to caffeine by drinking too much of it. Caffeine’s stimulating effects can last for six to eight hours and make it hard to fall asleep or cause middle-of-the-night wakefulness. STRESS Anxiety, excessive stress and difficulty shutting out worries trigger the release of body chemicals that act as stimulants. Try a relaxing bedtime ritual like a hot bath, meditation or progressive muscle relaxation, starting at the toes and working up to your head. Or, odd though it may seem, try reading something dull. If things you must remember or do the next day keep popping into your head, put a pad and pen next to the bed, write them down and then do your best to forget about them until morning. OTHER TIPS Years ago I mentioned that leg cramps were waking me up well before the alarm, and readers responded with myriad solutions, from bedtime stretches to magnesium supplements. What has worked best: drinking about eight ounces of tonic water (diet version) every day. Tonic water contains modest amounts of quinine, which used to be sold over-the-counter to reduce leg cramps. Another innocuous sleep aid that has proved miraculous for me is a nightly supplement of melatonin, which the body naturally produces after dark. The pineal gland in the brain is inactive during the day, but after sundown it starts spewing melatonin into the bloodstream. With a supplement on board, I fall asleep quickly, and if I awaken during the night, I return to sleep easily. A three-milligram supplement near bedtime is considered harmless and may help you as well, though it should not be given to children without consulting a doctor. If hot flashes are your current problem, ask your doctor about trying the prescription drug gabapentin.